Trewithen Gardens is a place where there’s no need to rush: time seems to stand still. Perhaps slightly less well known than some of Cornwall’s gardens, it’s a truly special spot that is definitely worth a visit. Full of intriguing pathways, there’s lots to discover here. In spring it comes alive with colour: Trewithen is famed for its collection of magnolias, and there are many magnificent rhododendrons, camellias and hydrangeas. Horticultural enthusiasts will enjoy tracking down Trewithen’s Champion Trees. There are twenty of these, all marked on the garden map you get when you arrive. These are trees that have been officially measured by the Tree Register and declared champions for being tallest of their type or having largest diameter. Children can have fun uncovering the hidden delights of the garden, like the camera obscura (which nestles amongst rhododendrons in a wooden structure that looks like a tree house), the sunken garden and the magnolia fountain. If you’re lucky, you might also catch a glimpse of a rather rare creature at Trewithen: there is a special enclosure where red squirrels live. Birds thrive at Trewithen, and you might see or hear woodpeckers (greater spotted, lesser spotted and green), little grebes, song thrushes, willow warblers, and finches. Buzzards, sparrowhawks, barn and tawny owls are also regular visitors. There are plenty of carefully placed benches throughout the gardens, offering an opportunity to sit down and soak up the atmosphere. Even when the garden is busy, there is room for everyone to roam, and it often feels like you’ve got the place to yourself. There are some lovely open spaces with picnic tables or room to spread out a rug and have a picnic. There is also a pleasant cafe which has an excellent selection of homemade cakes – ideal for afternoon tea. Trewithen has been owned by one family for over 280 years. Guided tours of the house, which has an interesting collection of paintings and furniture, are available on Monday and Tuesday afternoons (1 April – 31 July). The gardens are open 1 March – 30 September (Mondays to Saturdays), 10am – 4.30pm. From March-May the gardens are also open on Sundays. Keen gardeners can take a piece of Trewithen home with them – visit the Plant Centre next to the cafe to choose from a range of plants grown on the estate. Dogs on leads are welcome in the gardens. 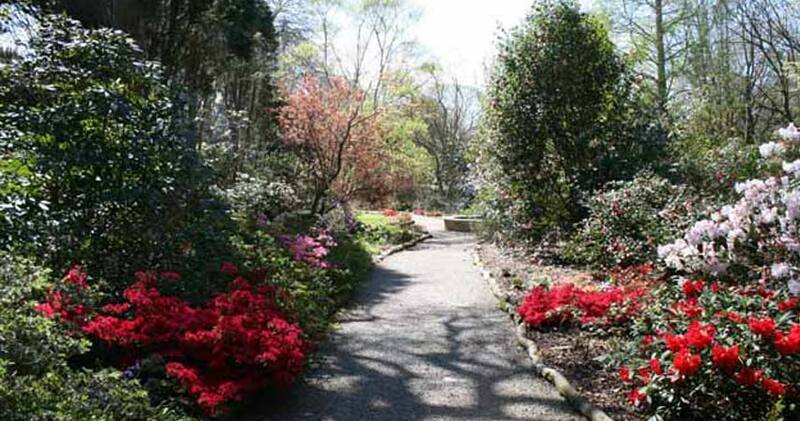 Trewithen Gardens is located just off the A390 in Grampound, only a few minutes’ drive from Bosinver (head towards Truro). There is ample parking.